At Palo Alto Software, we help entrepreneurs succeed with market-leading business software. Whether you are starting, running, or growing your business, our cloud-based and desktop tools are designed with your success in mind. Write, pitch, and manage your business plan from anywhere. Everything you need to create a great looking business plan. 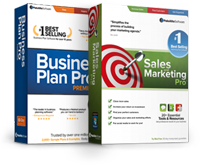 Save £60 when you buy Business Plan Pro Premier and Sales and Marketing Pro.